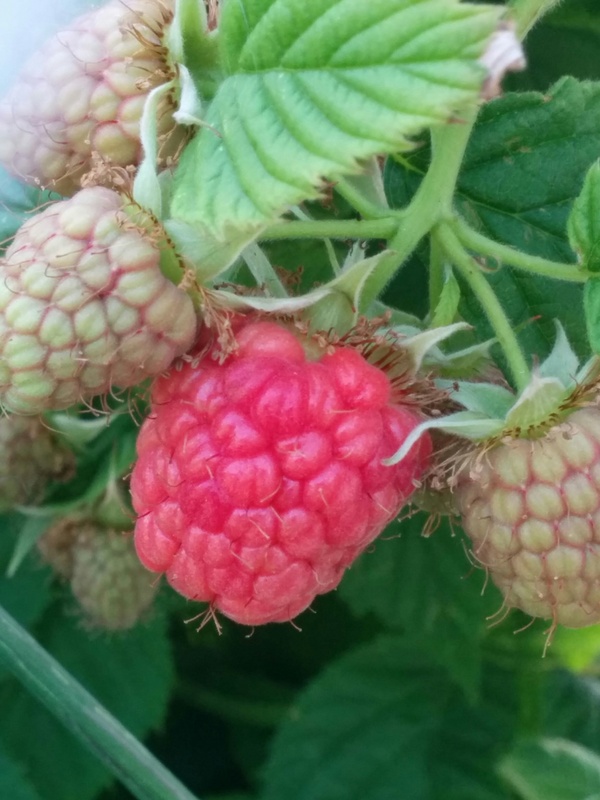 While I’m not feeling 100% today, I’ve been thinking about what to do with the soon-to-be glut of raspberries. There’s so much fruit on the bushes, I have a feeling we’re going to be inundated in the next few weeks. Growing up in South Australia, I never ate a fresh raspberry until I moved to Tasmania and they’re probably my favourite berry fruit. Usually I make ice cream or cheesecake with excess berries, which uses eggs up as well. But with Boysenberries, Youngberries and Loganberries starting to colour up too, I think it’s time to consider my options! I’m planning to make a Raspberry Upside Down cake next week for my birthday and already have enough berries for that. All I do with this is make up a simple sponge batter with 2 cups of self raising flour, 1 cup butter, 1 1/2 cups sugar (more if you like it sweeter), a teaspoon of baking powder and 4 eggs. Instead of splitting the mixture into two tins and filling it with jam and cream, I put the fresh fruit on the bottom of a deep baking pan and pour the batter over the top, baking for 20-30 minutes in a 180 C (350 F) oven. Once the cake’s turned out and still warm, it can be lovely to pour hot lemon syrup over for added zing or (for the adults only version) poke the still warm cake with a skewer and pour over a citrus flavoured liqueur. None of us are fans of jam so I am going to try mashing some with yogurt and drying it as fruit leather. But for large amounts of berries, I can’t go past Raspberry Vinegar Cordial. I first had this over 30 years ago on a hot summer day in Hobart and it is delicious. The principle here is to use the vinegar to not only preserve, but also to enhance the tangy sharpness of the fruit. It’s fabulous for very ripe fruit – and it’s ridiculously easy to make! Put the washed, drained fruit into a non-metallic bowl or pot and pour over the vinegar. Mash it to break the berries but don’t puree them. Cover the berry mash and leave it for a day or two. I have hear that some folk leave the mash for up to five days but I’ve never done more than two – patience is not my strong suit! Strain the mash carefully through muslin or an old, clean tea towel into a cooking pot, squeezing out as much of the precious juice as possible. Heat the juice and when it’s starting to simmer, add the sugar and boil for approximately five minutes. Decant into sterilised jars or bottles and seal immediately. If you want to keep this for winter consumption, I’d also recommend processing the bottles in a Fowlers bottling urn or water bath. Mine never lasts long enough for that! What’s your favourite berry fruit? And how do you like to serve and preserve them?